Oak frame homes are compatible with many building methods, but if you are looking for a product that provides build efficiency and high thermal performance, then softwood timber frame panels are a great option. The panel system design is extremely flexible allowing utilisation in any style of home. Each panel is custom designed and made for your home and includes door and window apertures. By integrating the design process at the very start of your project, we resolve all design issues before cutting any timber. There are a couple of ways to integrate an oak frame with a softwood panel system. 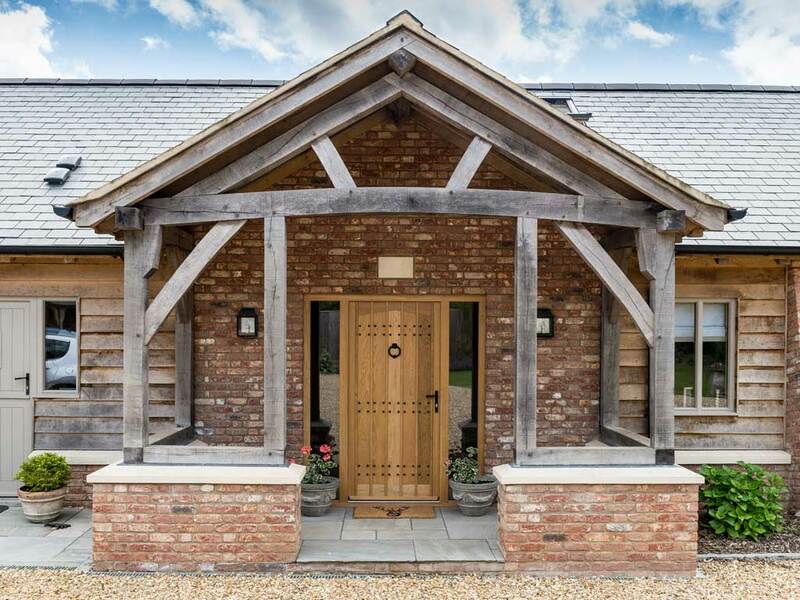 The oak frame can provide a complete structural or partial structural element to your home. With a complete structural oak frame, the oak provides the central structural element of the building with the softwood timber panels infilling the non-structural areas and wrapping the oak frame. With a partial structural oak frame, the softwood timber panels form an alternative construction method, reducing the cost of the oak frame by limiting it to specific areas of the home. Commonly the oak frame and softwood panel system share the structural attributes. A structure engineered in this way can provide a more cost-effective solution while still achieving a beautiful oak frame interior. The softwood timber panels create a wrap around the oak frame. They can quickly take your project from an oak framed structure to a wind and watertight one, helping you to move to the next phase of a self build mortgage. As they are made offsite, there is a reduction in onsite time and costs. It takes just 2-3 weeks to erect the panel system. Constructed from softwood studs and infilled with insulation, a range of insulation choices are available to suit your budget and preferences. There are standard options of PIR (Polyisocyanurate) or glass fibre and eco options of mineral wool or wood fibre. The panel system offers high thermal efficiency and reduced thermal bridging reducing energy bills and CO2 emissions for the lifetime of the building. The acoustic properties of high-density insulation mean that sound transfer between walls is minimal. It is important that the oak elements and softwood timber frame panels work in unison. An understanding of both structural systems is essential to ensure the success of your project. 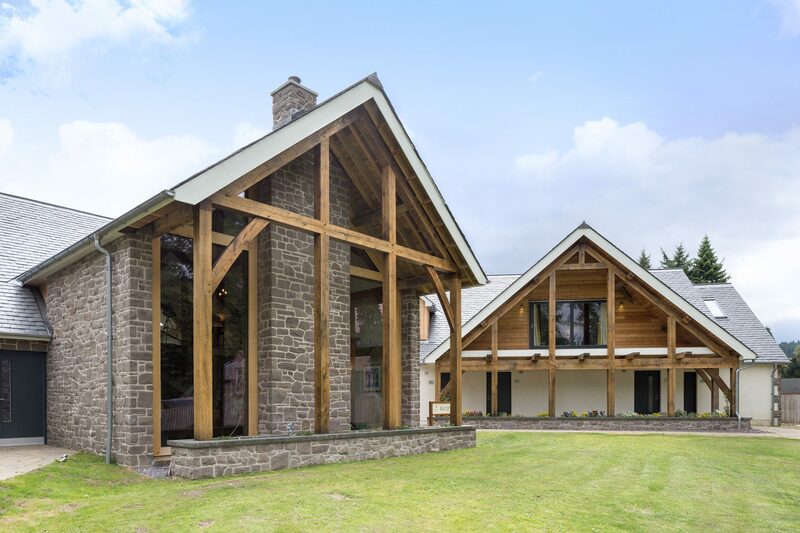 We have completed several projects using a combination of oak frame structure and softwood timber panels. An oak frame structure takes several years to dry and settle compared to the softwood panel structure. Our designers are experienced in working with the different tolerances and movement of these two structural elements. We have several excellent projects that combine oak framing and softwood panels. These have been designed and constructed in collaboration with Fleming Homes. Our united expertise ensures your self build will benefit from both structural systems. We are running a timber frame demo day in partnership with Fleming Homes on 4 May. Find out more and book your place here. Contact us for further details and to discuss your aspiration for an oak frame home. View our oak frame with softwood timber panel case studies below.